Suriya's Anjaan is now a game. Becoming a HIT even before hitting screen is the new trend. Social media seems to have redefined the advertising mantra. Producers are going completely online for film promotions emphasizing more on user interactions and immediacy on feedbacks by breaking teasers, trailers and singles through the web. Followed by VIP's trailer and Kaththi's teaser, Anjaan's teaser has managed to reach a milestone number. More then 1 million views in a matter of just 48 hours. Transcending a new technological barrier is Anjaan's next move. It will be "Game ON" for Suriya's birthday along with a cake. July 23rd will see an Android game embedded with the latest technology for mobile users. 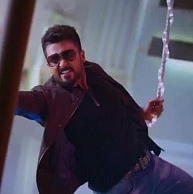 All Anjaan lovers out there can play this endless game, experiencing the elements of the movie, as tried out by the Hindi version of Ghajini and more recently Kochadaiiyaan. We wish the Anjaan team on this recent feat and their upcoming novel ventures. K S Ravikumar is fake!! A dazzling evening with DD's characteristic laughter! People looking for online information on Anjaan, Anjaan game, Anjaan teaser, Suriya birthday will find this news story useful.